With increasing influence of digitization in every sector, massive data generation has been witnessed in recent times. This has compelled installation of large scale data centres. This coupled with the transition towards cloud computing is collectively propelling the demand for huge electricity requirements. Increasing interest of end users in employing fuel cells for powering data centres has been the key interest of this market study. A comprehensive study related to various segments, such as power, product type and end use, has been provided across regions to get a better understanding of the fuel cell for data centre market at global as well as regional and country levels. The report begins with an executive summary of the fuel cell for data centre market offering a comprehensive global scenario. The next section provides an overview of the fuel cell for data centre market and covers the fuel cell for data centre market taxonomy and definitions. This is followed by key market trends describing the fuel cell for data centre market development background. The subsequent section of the fuel cell for data centre market study provides historic and futuristic view of the volume projections, followed by pricing analysis in different regions. The next section offers the value perspective of the fuel cell for data centre market. In the next section, PMR covers macro-economic factors, forecast factors and value chain analysis in the fuel cell for data centre market. This section also highlights the market dynamics, such as drivers and restraints impacting the fuel cell for data centre market growth at a global level. Market opportunities for fuel cell for data centre manufacturers have been presented as well. Subsequent sections of the report provide value (US$ Mn) and volume (Units) projections for the fuel cells for data centre market on the basis of the aforementioned segments at a global level. The market information, along with key facts and insights, covers unique analysis frameworks, such as absolute $ opportunity analysis, year-on-year growth comparison, market attractiveness analysis, for each of the sub-types covered in each segment. The next section of the report presents a summarized view of the global fuel cells for data centre market, based on seven prominent regions considered in the study. This includes regional market position, growth potential and market attractiveness analysis for each of these regions. The detailed regional analysis follows the global fuel cell for data centre market study for each segment. These sections analyze the degree to which the global drivers are influencing the regional fuel cell for data centre markets. An analysis of the key emerging countries in the fuel cell for data centre market has been provided for the rapidly developing countries offering lucrative growth for existing and new market participants. The following sections describe the overall fuel cell for data centre market structure, competition analysis and detailed company profiles of prominent market participants, such as Bloom Energy, Doosan Fuel Cell America, Inc., FuelCell Energy, Inc., Altergy, Logan Energy, AFC Energy, Toshiba Fuel Cell Power Systems Corporation, Plug Power, Panasonic Corporation, Hydrogenics and Ballard Power Systems, among others. The primary stakeholders covered in the report are the fuel cell for data centre manufacturers. In order to offer an accurate forecast, the team started by sizing the current market, forming the basis of how the global fuel cells for data centre market is expected to develop in the future. The global fuel cell for data centre market values represented were agglomerated by collecting data and information at a regional level. Given the characteristics of the fuel cells for data centre market, triangulation of the primary research, secondary research and our own analysis was performed. However, forecasting the market in terms of various segments and regions is more a matter of quantifying expectations and identifying opportunities rather than rationalizing them after the completion of the forecast exercise. Fuel cell for data centre market size in 2017 was US$ 66 Mn. The fuel cell for data centre market will observe high growth of 15.5% over 2018-2028. Power consumption by data centres is estimated to account for over 2% of total electricity consumption around the world. Energy consumption by data centres is anticipated to increase at a steady pace. For instance, recent studies suggest that data centres in the US alone utilized an annual energy of over 91 TWh in 2013, which is expected to increase by 6.3% and reach nearly 140 TWh by the end of 2020 (over 507.9 TWh, globally, by 2020). By region, North America’s fuel cell for data centre is projected to hold a relatively dominant share in the global fuel cell for data centre market. 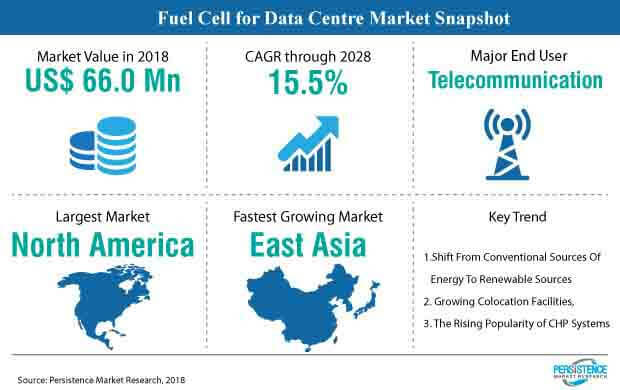 In terms of growth opportunities in the Fuel cell for data centre market, Asia Pacific and MEA, with growing ICT spending and growing focus on renewable energy, are projected to generate high demand in the Fuel cell for data centre market. The complexities of Data Centre operations, including network infrastructure and energy usage, encourage enterprises to bypass internal data centres and opt for co-location facilities. This will drive the growth of the commercial segment of the collocated data Centre, which in turn, will give a push to the Fuel cell for data centre market. With oil & gas prices rising every year, renewable sources of energy are being seen as an alternative to power the data centres of tomorrow. However, solar and wind sources present various challenges to be practically implemented on ground level, among which, the requirement of open spaces for installation of these power plants is the key concern. As per the power density comparison, fuel cells for data centres require lesser space to generate the same amount of energy than it takes for a solar or wind facility. A tremendous rise in the installation of new data centres has been observed around the world and attempts are being made to ramp up the existing capabilities of previously installed data centres. For data centres to work efficiently and with reduced carbon footprint, operators are shifting towards renewable energy sources, such as fuel cell for data centre power requirements. Hence, the demand for Fuel cell for data centres is anticipated to increase during the forecast period. A significant share of CapEx (Capital Expenditure) and OpEx (Operating Expenditure) in data Centre comes from expensive power transmission systems. Installing fuel cells at the utility power level enhances the overall efficiency and has been observed to make a noteworthy impact on the fuel cell for data centre market. The global Fuel cell for data centre market is a consolidated market wherein Tier 1 companies hold more than 60-70% revenue share. Top companies in the Fuel cell for data centre market include Bloom Energy, FuelCell Energy, Inc., Doosan Fuel Cell America Inc., Plug Power Inc., Toshiba Fuel Cell Power Systems Corporation (TFPC), Hydrogenics, Panasonic Corporation, Logan Energy Limited, AFC Energy PLC, Plug Power Inc., and Ballard Power Systems Inc.
As part of their business strategy, prominent fuel cell for data centre players have been focusing on gaining market share in North America, East Asia, and Europe markets as these regions account for the dominant share in terms of production. As a differentiating strategy, fuel cell for data centre market participants are focusing on cost reduction and development of highly efficient Fuel cell systems to be used in fuel cell for data centres.